Hi Frédéric François Chopin (ha Pinolako: Fryderyk Franciszek Chopin agsob liwat nga ginsusurat an apelyido ha Pinolako nga Szopen) (Marso 1, 1810– Oktubre 17, 1849) usa nga Polako nga kompositor ngan virtuoso nga pianista. Usa hiya han mga harangdon nga mga maestro hin Romantiko nga musika. ↑ (Frinanses) Rey Alain (1993). Le petit Robert 2 : ( dictionnaire universel des noms propres, alphabétique et analogique ). INIST-CNRS, Cote INIST : L 22712: Le Robert, Paris, FRANCE. ISBN 2-85036-210-7. ↑ Arthur Hedley et al., "Chopin, Frédéric (François), Encyclopaedia Britannica, p. 263. Ashbrooke, William (n.d). 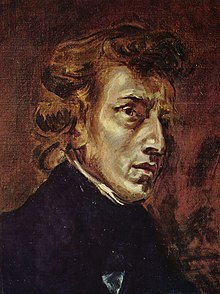 "Chopin", in The New Grove Dictionary of Opera online, accessed 4 August 2014. (ginkikinahanglan hin subscription). Barcz, Maria (14 August 2010). "Etiuda paryska" (ha Polish). Gwiazda Polarna 101 (17): pp. 15–16. Chen, Shu-fen Viola (2009). A Performer's Analysis of the Four Ballades by Frederic Chopin. ProQuest. ISBN 978-1-109-13042-3. http://books.google.com/books?id=rf-qiAc9miUC&pg=PA14. Eddie, Dr William (28 January 2013). Charles Valentin Alkan: His Life and His Music. Ashgate Publishing, Ltd.. ISBN 978-1-4094-9364-8. http://books.google.com/books?id=08qhAgAAQBAJ&pg=PA8. Goldberg, Halina (2004). The Age of Chopin: Interdisciplinary Inquiries. Indiana University Press. ISBN 0-253-21628-1. http://books.google.com/books?id=lPSSMhdW_bQC&pg=PA88. Hall-Swadley, Janita R. (15 July 2011). The Collected Writings of Franz Liszt: F. Chopin. Scarecrow Press. ISBN 978-1-4616-6409-3. http://books.google.com/books?id=DrivAkWuo8cC&pg=PA32. Jachimecki, Zdzisław (1937). "Chopin, Fryderyk Franciszek" (ha Polish). Polski słownik biograficzny. 3. Kraków: Polska Akademia Umiejętności. pp. 420–26. Jakubowski, Jan Zygmunt, ed. (1979) (ha Polish). Literatura polska od średniowiecza to pozytywizmu. Warsaw: Państwowe Wydawnictwo Naukowe. ISBN 83-01-00201-8. Lanza, Andrea (n.d.). "Orefice, Giacomo" in Oxford Companion to Music, Oxford Music Online, accessed 8 August 2014. (ginkikinahanglan hin subscription). Latham, Alison (n.d.). "Rubato" in Oxford Companion to Music, Oxford Music Online (ginkikinahanglan hin subscription), accessed 15 July 2014. Samson, Jim (8 December 1994). The Cambridge Companion to Chopin. Cambridge: Cambridge University Press. ISBN 978-0-521-47752-9. http://books.google.com/books?id=spdmAgb78xwC&pg=PA136. Schonberg, Harold C. (1987). Great Pianists. New York: Simon and Schuster. ISBN 978-0-671-63837-5. http://books.google.com/books?id=gtlCuMH2O4gC&pg=PA151. Szklener, Artur (2010). "Fryckowe lato: czyli wakacyjne muzykowanie Chopina" [Fritz's Summers: Chopin's Musical Vacations]. Magazyn Chopin: Miesięcznik Narodowego Instytutu Fryderyka Chopina (ha Polish) (4): 8–9. Ini nga pakli kataposan nga ginliwat dida han 13:58, 22 Enero 2015.